Multi-tasking is not everyone’s cup of tea. In today’s fast-paced era, we have several assignments we need to track, whether you’re a student or a working professional. Soshiku is a free online service for high school and college students that helps schedule and keep track of homework assignments. The service provides email as well as SMS notification reminders (in certain regions) for keeping track of your work. Although it is directed at students, using it will quickly give you the idea that it can be easily put to broader general use. Apart from just reminders, the web site has many useful features. With each assignment, you can save notes, manage tasks, attach files, and share messages with your partners. Partners are people you wish to collaborate on an assignment. After signing up, click on new course to set up an assignment. After that, a “New Assignment” link will appear through which you can add new assignments to particular courses. While adding new assignments you can easily add to-do-list type of tasks for each assignment and specify who is going to be responsible for them. 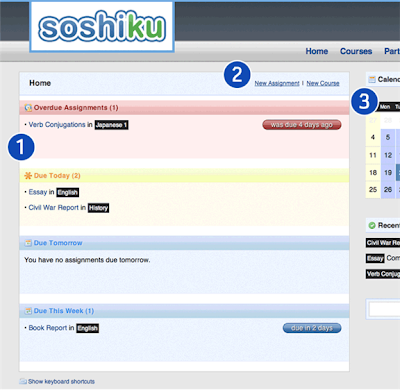 Assignments can be added remotely by emailing them to add@soshiku.com in the syntax in due . Once you’ve set up all your due dates and projects, you can see a summary in the home page. Here you will see all your overdue and upcoming assignments. The calendar shows you when everything is due. Click a date to see exactly what is due that day. Under recent tasks you can view the five most recent tasks that have been assigned to you. You can even add new courses and assignments since these buttons are available on most pages. Notifications can be configured in the preferences, but SMS only works with US carriers.